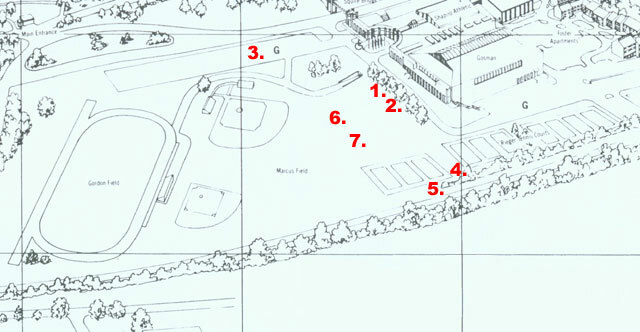 While the exposed area around the athletic fields is home only to planted trees, such as Red and Black Oaks, and Sugar Maples (especially in G-Lot, the athletic center parking lot), the fencerow along the Southeast side of the fields (bordering with the tracks of the Commuter Rail) is a good place to find field plants, such as Smooth Sumac and Common Milkweed. Numbers on the map refer to the location of the numbered species* below. Click on a species name to go to that species' individual page.